Get started shopping for deals on the Sony Xperia XA2 with TigerMobiles.com. Loads of screen space, plenty of power, and fantastic cameras make this one of the best mid-range mobiles around. And the XA2 is a bit of a looker as well. Think that this could be the perfect smartphone for you? Then check out our great deals on the Sony Xperia XA2 below. Sony’s Xperia line of phones have been around for a good few years now, and offer something for everyone. From the top of the line Xperia XZ series, down to affordable, budget models. Their next incarnation is the XA2, a revamp of the older XA1 model, a device designed around awesome mobile photography. Does the world need an affordable smartphone with great camera specs? Silly question, really. Why should you want the Xperia XA2? Well, obviously, there are those cameras. Other than that, you’re getting a decent mid-range phone with good power, a nice screen, and a few flagship specs to sweeten the deal. In fact, the Xperia XA2 is an all around great phone, and one that mid-range shoppers should certainly consider. This is very clearly a Sony device. Hard edges, slim lines, an unashamedly rectangular design that’s instantly recognisable. The XA2 does get a metal build though, keeping weight down and giving it a real luxury hand feel. Yes, there’s plenty of bezel around that screen, but the XA2 still fits nicely both in the hand and in the pocket. Aside from design, the XA2 gets some nice upgrades on the older XA1 model. There’s more power, a larger screen, a bigger battery. Basically, as an upgrade, the XA2 ticks all the boxes and then some. You won’t be breaking the bank with the Xperia XA2, but you will be getting a surprisingly high specced phone. Power, screen, cameras, everything you need to make this a very good purchase indeed. Let’s start with the key issue of performance here. The XA2 gets a Snapdragon 630 chipset, octo core processing power, thanks to a Cortex-A53 processor, and an impressive 3 GB of RAM. Long story short, it’s fast. Not the fastest phone around, but more than powerful enough for the average user. This, like all Xperias, is an Android device. You’ll be running Android 8.0 Oreo out of the box. This newest version of the OS will give you more stability and speed, as well as a few neat new features, including better notification management, split screening and more. Yes, there are faster phones around. But you’re unlikely to find any in this price category. More to the point, the XA2 has more than enough power to do everything the average user will need it to do. Performance here is excellent. Moving on to the display, and here you’re getting 5.2 inches of real estate. That should be more than enough to comfortably type and watch videos, whilst still being compact enough that you can carry the XA2 in your pocket. Resolution gets a nice upgrade from the XA1 as well. You’re getting full HD, with 1080 x 1920 pixels (so around 424 PPI). Plus, this is an LCD screen, so not only do you get great sharpness and clarity, but you get good colour reproduction as well. Add in IPS tech for great viewing angles, and you’ve got something that’s very nice to look at. For a mid range phone, these screen specs more than satisfy. In fact, the display on the XA2 is even better than the numbers might imply, with warm colours and a nice crispness to even high definition images. Right, so it’s cameras that are the selling point here, and they don’t disappoint, particularly at this price point. At the front there’s an 8 MP cam, which should be more than satisfactory for selfies and video calling. Moving around to the back you’re getting a 23 MP, f/2.0 aperture, 24 mm, 1/2.3’’ sensor camera. That’s a lot of tech talk, but in basic terms you’re getting a good, sharp camera. You also get everything else that you’d expect to see, so LED flash, phase detection autofocus, touch focus, geo tagging, HDR and all the rest. Plus, 4K video recording, which isn’t bad at all. The XA2 is being marketed as a camera phone, and that’s exactly what it is. Pics are sharp, clear, with good colour reproduction, everything you want if you’re into mobile photography. There aren’t tons of special features here (we wouldn’t expect there to be on a mid range phone), but there are a few things to talk about. The XA2 does have a USB C charging port, which is reversible and gives faster charge times. There’s a headphone jack too, something absent from many top end phones these days. 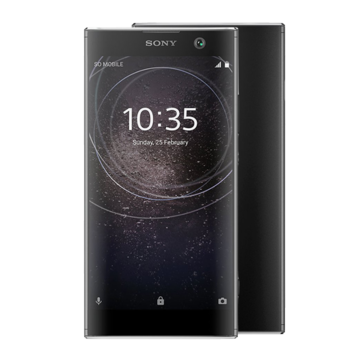 Unlike many of Sony’s mid range devices, the XA2 does feature a fingerprint sensor for added security as well as access to digital payment systems. Finally, battery life has been much improved from the XA1. There’s a Li-Ion 3300 mAh battery on board that Sony are saying should last 33% longer than that on the older XA1. And QuickCharge 3.0 tech means charging is faster than ever. The Sony Xperia XA2 is a fantastic mid-range phone with great photo capabilities. Lots of power, a decent screen, and amazing cameras, plus a few added extras. If you’re looking for a phone that won’t break the bank but that can still take excellent photos, then the XA2 has to be a clear choice. Connectivity wise you’re getting the usual options: WiFi, Bluetooth, 3G, and 4G. You’re getting 32 GB of internal memory, which isn’t bad. However, the XA2 does have an SD card slot, so you can add up to 256 GB of extra storage should you need it. Right, so what don’t we like? There’s nothing major, to be honest. The bezelling around the screen is quite noticeable when compared to the more modern looking near-bezel-less phones we’re starting to see. But that’s just in keeping with Sony’s design ethos. Other than that, the XA2 really does meet all our criteria. If you want a great mid-range device and you’re especially interested in taking great pics, then you need to check out the Sony Xperia XA2, you won’t regret.